3D printing is a term that covers a number of techniques that use some similar core concepts. One of the most notable is stereolithography, or SL. It is one of the oldest methods of 3D printing, but it is also one of the most common. Stereolithography works by translating a CAD file into, typically, Standard Tessellation Language (STL). An STL file divides the CAD model into layers, which are key for the 3D printing process, since stereolithography builds objects layer by layer. Stereolithography can be used to create almost anything, though not instantly. Every layer of material needs time to harden (cure). The technology is constantly being developed and updated to make it faster, cheaper, and capable of providing better results. The modern approach to stereolithography uses ultraviolet light to help accelerate the curing process significantly. 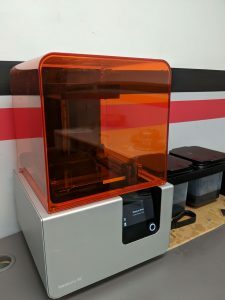 A stereolithography 3D printer consists of a tank containing liquid plastic called photopolymer, a perforated platform that is lowered into that photopolymer tank, an ultraviolet (UV) laser, and a computer that controls that platform and the laser. A thin layer of photopolymer is exposed above the perforated platform. The computer directs the UV laser to “paint” the layer in the desired pattern. The photopolymer hardens as soon as it comes into contact with the UV laser. After the layer is fully “painted” and cured, the platform is lowered and the process begins again on the next layer. These steps are repeated over and over again until the object has been completely printed. When the process is finished, the platform is raised to expose the final result. In most cases, the object will then need to be rinsed with a solvent to remove excess bits of material. The object can also be baked in a UV oven to ensure it is fully cured. 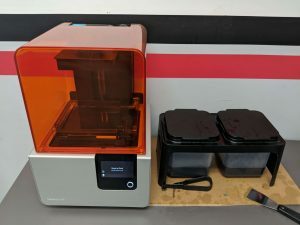 This seems like it is a quick, relatively clean process, but the time stereolithography needs to complete depends on a few factors. The size of the object can make a huge difference. Small objects (often produced by smaller 3D printers) can take usually six to twelve hours to complete. Large objects that are (requiring large 3D printers) can take several days. The desired quality can also affect the time the process requires; smoother, higher quality objects need more time to print, while rougher objects with more visible layers need less. Objects printed with stereolithography usually have a very smooth surface, especially if the printer is given time. This makes it good for any object where you need a precise fit or a clean look. It’s also a great process for creating oddly shaped objects that would be very difficult to manufacture using any other process. Stereolithography is often used to produce prototypes thanks to the high quality and quick production time. Some industries even use this process to create their final products. All this said, stereolithography is fairly expensive, which is why is not more commonly used for mass manufacturing. It also requires some post-processing after the printing is completed, which naturally adds more cost. The cost is coming down thanks to extensive research and improving technology. At Jawstec, we are experts in stereographic 3D printing and many other 3D printing techniques. We strive to provide you the highest quality 3D printed parts for the fraction of the cost of other manufacturers. Our 3D design services can help you turn ideas into reality from sketches, rough CAD drawings, or even just detailed instructions. Contact us today to see how we can help you use 3D printing to create the products you need.